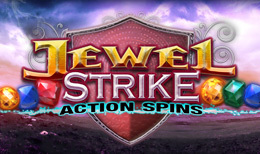 Welcome to Jewel Strike the epitome of the 5 line gem-based slot game that enables you to stack your wins to create epic wins and wipe out symbols from the reels. Part of Germany’s Gauselmann Group, Blueprint gaming is an England based developer, specialising in online slot games. Being played in over one hundred thousand land based terminals across Europe, this developer has established themselves well in a booming industry, creating a number of fan favourites. From Paws of Fury, to the amusing ‘Duckula,’ Blueprint continues to improve upon it’s already well loved portfolio, with unique twists to their games that always make them enjoyable. There is a chance you might know them for their recently released ‘Deal or No Deal’ licensed slot game, and the associated online scratch card as well. Keep an eye out for their games in the future! It is difficult not to associate gems with treasures. In the world of online slot gaming, these treasures are very clearly huge prizes. From Blueprint’s perspective, this theme obviously works well with the player. Who does not want to see gems spilling all over their screen, rewarding them with great pay outs? Jewel Strike allows players to live out this dream. From a screen covered with valuable gems, to a highly stylised aesthetic, this game appeals to all who play it. As it stands, it is easy to say that this is online slot gaming in its purest form. Even the music gives you the impression that great prizes are to be won. The upbeat, optimistic tune guarantees your enjoyment of this slot, even between wins. It is impossible to go wrong with this online slot game. With a five by three reel board, and ten pay lines to potentially win from, Jewel Strike rewards play that is a little more adventurous than a regular slot. Although you cannot adjust the number of pay lines to be bet on across the reels, this game appeals to both low and high rollers alike. With a minimum bet of just 0.02 a line (so 0.20 minimum total) up to a maximum bet of 25.00 in the normal mode, it is easy to play towards both philosophies. Of course, it is completely up to you whether you decide to play under high stakes or not. Personally, I believe that Jewel Strike functions well when you play for low stakes, but for much longer. When you do this, you improve your chances for the incredible Colossal Reel. This is potentially triggered across any spin at all. As you can imagine, this Colossal Gem fills up the entirety of three consecutive reels, completely guaranteeing a win on every line. This incredibly bonus is rare, but when it does happen, you feel incredibly lucky; filling your pockets with treasure. If you want to risk a little bit more to achieve incredible prizes, you have the opportunity to play in the Epic Spins mode. When this happens, the entire reel changes – you can multiply how much you bet to eliminate low paying symbols, potentially increasing your chances of a win. For a monumental 20x your normal mode bet (meaning you can bet 500.00 total!) all classic casino symbols are eliminated, leaving just gems. With more precious treasure on your reel, are you more likely to win? A colourful online slot game with a unique mechanic, Jewel Strike is a wholehearted recommendation. Have fun! See more cool casino games we have at dreamjackpot.com.